I saw this on Facebook. Is it true? A pack (wolves): The first 3 are the older or sick and they set the pace of the group. If it was on the contrary, they would be left behind and lost contact with the pack. In ambush case they would be sacrificed. The following are the 5 strongest. In the center follow the remaining members of the pack, and at the end of the group follow the other 5 stronger. Last, alone, follows the alpha wolf. It controls everything from the rear. That position can control the whole group, decide the direction to follow and anticipate the attacks of opponents. The pack follows the rhythm of the elders and the head of the command that imposes the spirit of mutual help not leaving anyone behind. No, the pack is led by the alpha (breeding) females. 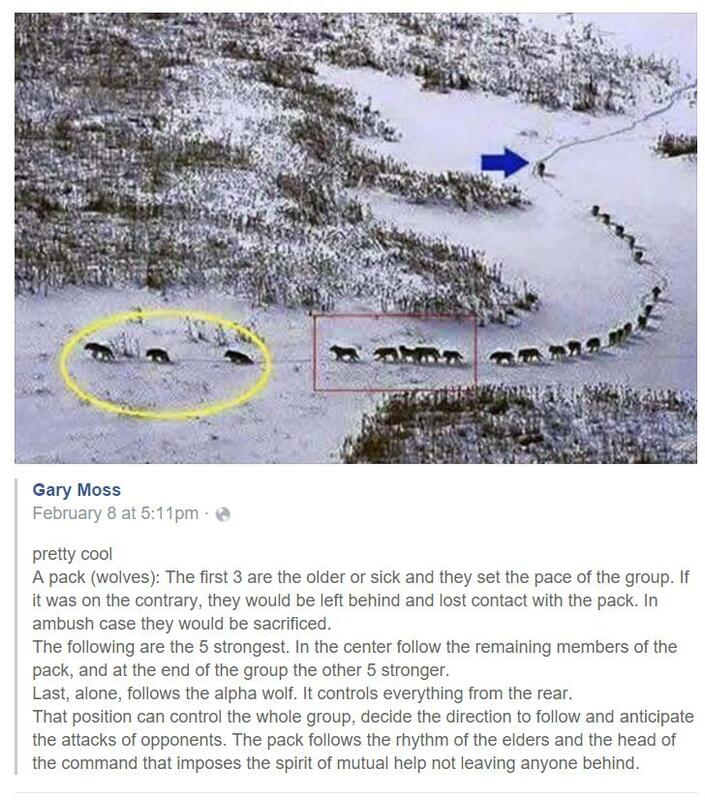 Snopes has an article on the picture which also include the history of the post, and also a note about the use of the term "alpha" for wolf packs. The screenshot included in the question contains a block of text with a long interpretation by someone named Gary Moss. Moss's interpretation is that packs of wolves have alpha animals, which go in back, while older, weaker animals go in front. Supposedly the alphas "control the whole group" from behind. The prevailing view of a wolf (Canis lupus) pack is that of a group of individuals ever vying for dominance but held in check by the "alpha" pair, the alpha male and the alpha female. Most research on the social dynamics of wolf packs, however, has been conducted on non-natural assortments of captive wolves. Here I describe the wolf-pack social order as it occurs in nature, discuss the alpha concept and social dominance and submission, and present data on the precise relationships among members in free-living packs based on a literature review and 13 summers of observations of wolves on Ellesmere Island, Northwest Territories, Canada. I conclude that the typical wolf pack is a family, with the adult parents guiding the activities of the group in a division-of-labor system in which the female predominates primarily in such activities as pup care and defense and the male primarily during foraging and food-provisioning and the travels associated with them. Not the answer you're looking for? Browse other questions tagged ethology .